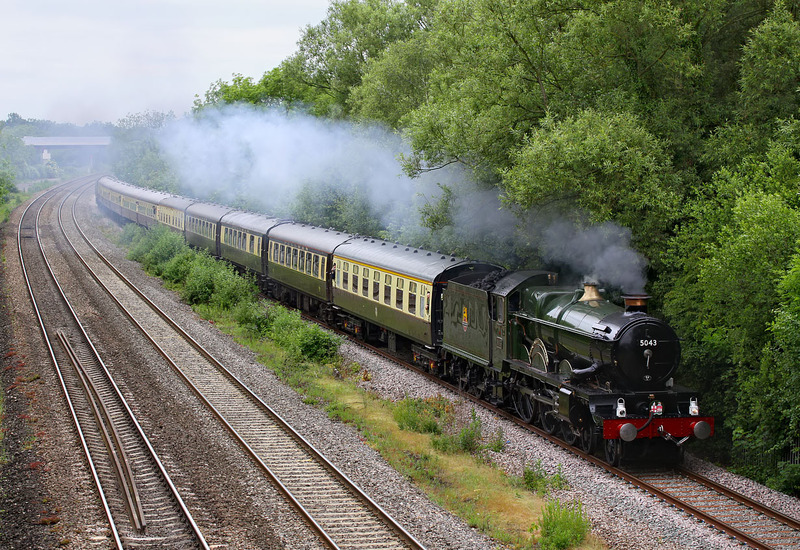 Castle Class 4-6-0 5043 Earl of Mount Edgcumbe runs along the up relief line at Wolvercote on 19 June 2010 with the Vintage Trains 1Z53 07:06 Solihull to Swansea 'Red Dragon' railtour. Even at 08:30 the 'Castle' is nearing journey's end, for it will hand the train over to LMS Princess Class 4-6-2 6201 Princess Elizabeth at Foxhall Junction, Didcot. Note how close the trees are to the track on the relief line, with the exhaust blasting up through the leaves. Obviously a bit too close, because close inspection of the high res version of this picture shows a clump of leaves caught in mid flight in front of the first coach, having obviously been knocked off one of the overhanging branches!